Supportive girl explaining to her classmates in the classroom. Group of intelligent college students discussing the educational materials together. 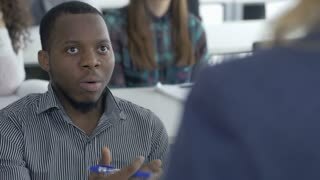 Confident university student discussing with a lecturer. Intelligent and motivated young man actively participating in classroom activity asking professor a question.